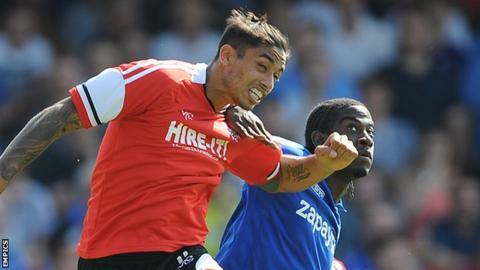 Aman Verma scored two, including a late winner, as Kidderminster Harriers twice came from behind to beat Forest Green. Lee Hughes nodded in against his former club to give the hosts the lead, only for Verma to level with a firm header. James Norwood put Forest Green back in front from close range but Jack Byrne headed home Jared Hodgkiss's cross to make it 2-2 at the break. Verma then had an effort disallowed for offside before firing in a late winner from six yards following a corner. "We're creating a lot of chances and we need to convert them, but at the same time we've got to be defensively tighter and meaner back there - we'd have had to score four goals to win - and that doesn't happen very often. "We never really sustain our pressure in games and take those opportunities at the other end to give our defenders that bit of respite, but we've got to expect teams to come in to games and have spells, whether we're at home or not and we've got to deal with those spells better. "We've got to put this behind us now and thankfully we've got another game in 48 hours." Match ends, Forest Green Rovers 2, Kidderminster Harriers 3. Second Half ends, Forest Green Rovers 2, Kidderminster Harriers 3. Attempt saved. Rob Sinclair (Forest Green Rovers) right footed shot from the centre of the box is saved. Attempt saved. Lee Hughes (Forest Green Rovers) header from the centre of the box is saved. Substitution, Kidderminster Harriers. Jake Green replaces Jack Byrne. Goal! Forest Green Rovers 2, Kidderminster Harriers 3. Aman Verma (Kidderminster Harriers) left footed shot from the right side of the six yard box to the top left corner. Assisted by Craig Reid. Attempt blocked. Jack Byrne (Kidderminster Harriers) left footed shot from outside the box is blocked. Attempt missed. Lee Hughes (Forest Green Rovers) right footed shot from the right side of the box is too high. Foul by Jamie Grimes (Kidderminster Harriers). Substitution, Kidderminster Harriers. Akwasi Asante replaces Reece Styche. Attempt saved. James Norwood (Forest Green Rovers) header from the centre of the box is saved. Assisted by David Pipe with a cross. Attempt missed. Sam Wedgbury (Forest Green Rovers) right footed shot from outside the box is too high. Foul by Luke Oliver (Forest Green Rovers). Craig Reid (Kidderminster Harriers) wins a free kick. Jon Parkin (Forest Green Rovers) is shown the yellow card for a bad foul. Kyle Storer (Kidderminster Harriers) is shown the yellow card for a bad foul. Attempt missed. James Norwood (Forest Green Rovers) right footed shot from the right side of the six yard box misses to the right. Attempt missed. Craig Reid (Kidderminster Harriers) right footed shot from a difficult angle on the right misses to the right. Offside, Kidderminster Harriers. Marvin Johnson tries a through ball, but Marvin Johnson is caught offside.